There’s always a lot to do when you’re managing a fleet, which is why we believe it can make sense to break things down into straightforward steps. We’ve suggested one for each month of 2019, so you don’t get overwhelmed at any point during the year. The plate change in March may still be a couple of months away, but begin planning for any new orders now. You may want to look at whole life cost (WLC) analysis to start the process. With new driving offences such as middle lane hogging, driving licence points can add up quicker than ever. Running DVLA checks on your drivers at least once a year means you can ensure they are still eligible to drive, and help spot any driver safety or training issues. Now you’ve had time to produce the data, this could be a good opportunity to review your fleet’s year-on-year performance to discover trends and evaluate spend. Our Value Statements are produced twice a year to help identify the biggest cost savings for our customers. One of the best ways to keep your fleet’s data up-to-date is to run an audit. At a minimum, this should be once a year, as you may find missing information about your active vehicles, such as driver contact details. The fleet world is constantly changing, so a policy that was fine 12 months ago may not safeguard your company any more. Reviewing everything at least once a year can help you find anything that’s missing. There’s another plate change on the way in September. As with our January suggestion, planning ahead by carrying out a whole life cost analysis can help you determine the most cost-effective vehicles. 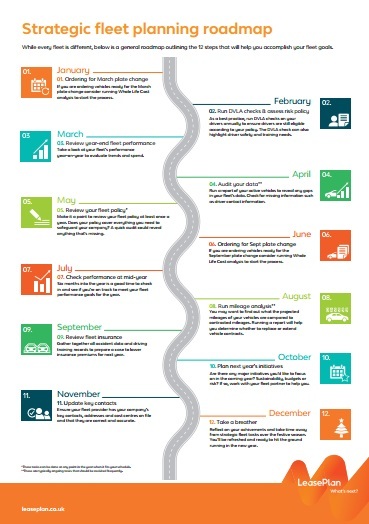 Half way through the year, why not check if you’re on track to achieve your fleet performance goals? If you’re ahead, congratulations! If you’re behind, there’s enough time to make changes. Analysing your vehicles’ mileage can help you see how projections compare with reality – and the information can guide decisions about replacing or extending vehicle contracts. No-one likes higher insurance premiums and a bit of preparation can go a long way in driving them down. Now could be the time to pull together your accident data and driving training records to start preparing a case for next year. Don’t leave your New Year’s Resolutions to the last minute. If there are major initiatives you’d like to focus on in 2020, start talking with your fleet partner now to help you achieve your aims. Make sure your fleet partner has accurate details for your company – key contacts, addresses and cost centres. Getting it sorted now could save a lot of time down the line. Take a break to reflect on your achievements. It’s been a busy year and there’s even more to look forward to in 2020.